PHNOM PENH, 30 November 2012 (The Cambodia Herald) - A senior official of the ruling Cambodian People's Party has rejected a request by Sam Rainsy Party lawmaker Son Chhay to discuss the return to Cambodia of exiled opposition leader Sam Rainsy. 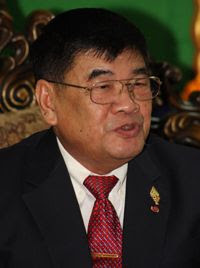 Cheam Yeap (pictured), chairman of the National Assembly Commission on Economy, Finance, Banking and Audit, said such talks could be held only if Sam Rainsy was a political prisoner rather than being convicted for violating criminal law. He quoted Prime Minister Hun Sen as saying that Cambodia has no political prisoners. And while the country does have politicians who violate the law, the government has no right to interfere in the judicial system, he said. Cheam Yeap, who is also a member of the CPP politburo, said convicts usually had to serve at least two thirds of their sentence before having the right to seek a pardon from king. Sam Rainsy, who is believed to be living in France, has been been sentenced to 12 years for forgery and uprooting markers along the border with Vietnam. For the second time in Cambodia’s history, lawmakers, civil servants and officials will have to declare their assets to the government’s Anti-Corruption Unit (ACU), despite criticisms from civil society figures who maintain that the confidential asset declaration process amounts to no declaration at all. From January 1 through to January 31, legislators, commune officials, high-ranking civil servants and ACU employees themselves will submit sealed envelopes containing lists of their holdings – envelopes which can only be opened by the chairman of the ACU, and, even then, only in the event of an investigation, ACU official Sar Sambath said yesterday. Though the process of declaring assets is intended to help the government ferret out ill-gotten gains, rights groups and observers say the law’s gaping loopholes leave more than enough room for corruption to slip through, undetected. “We have some questions about the way in which we are asked to submit, or declare,” said Sam Rainsy Party parliamentarian Son Chhay. Chhay said the forms for declaring assets asked respondents to list only physical property, not cash, and didn’t require the assets of officials’ family members – whom he said often keep officials’ money under their names. 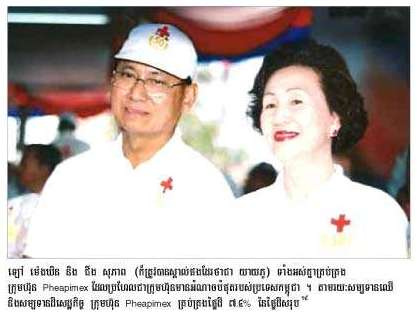 Senator Lao Meng Khing and his wife, Cheung Sopheap, alias Yeay Phu. Prime Minister Hun Sen has reclassified 4,158 hectares of a massive land concession owned by the wife of Senator Lao Meng Khin from his own party for displaced families in Kampong Chhnang province. A jubilant representative of the 4,506 families who have long battled against the 315,028 hectare concession granted to Cheung Sopheap’s Pheapimex Group and now stand to benefit thanked the prime minister. “Now we are very happy after Prime Minister Hun Sen’s voluntary youths re-measured the land for us, but we are still concerned about what will happen in the future,” said Chea Sophon, a representative of villagers in Tek Phos district. He thanked the premier for taking their difficulties into account and said the victory had come because villagers had exerted themselves through every channel. In a document from the Royal Book signed by the premier on October 26, 547 plots were granted to 184 families for actual cultivation while 484 hectares was demarcated as a community forest. In total, 8,200 families have been affected since the 2000 granting of the giant Pheapimex concession to develop plantations across parts of Kampong Chhnang and Pursat provinces. Mr. Pham Van Dong and Mr. Heng Samrin sign Vietnam-Cambodia joint statement on August 25th, 1979 [under the late Ho's watchful eyes]. The purpose of this paper is to explore the causes and sources of the continued suffering of the majority of the Cambodian people and the continued hold of power in Cambodia by the criminal regime of the Cambodian People's Party (CPP). At the same time, the international community appears to also capitulate to Hun Sen's threats and manipulations. Cambodians are now in these death traps that are built by both the Vietnamese and our own people, and it will not be easy to get out of them. It is hoped that by looking squarely into the causes and sources of this tragedy, future generations of Cambodians inside and outside Cambodia might be able to come up with new ideas in order to allow the Cambodian people to get out safely from these death traps. Most Cambodians still blame the Vietnamese for all the disaster that befell on Cambodia since the 18th century. It is true that Vietnam has been trying to colonize Cambodia for almost three centuries. It is true that this colonialist policy of Vietnam continues until today. 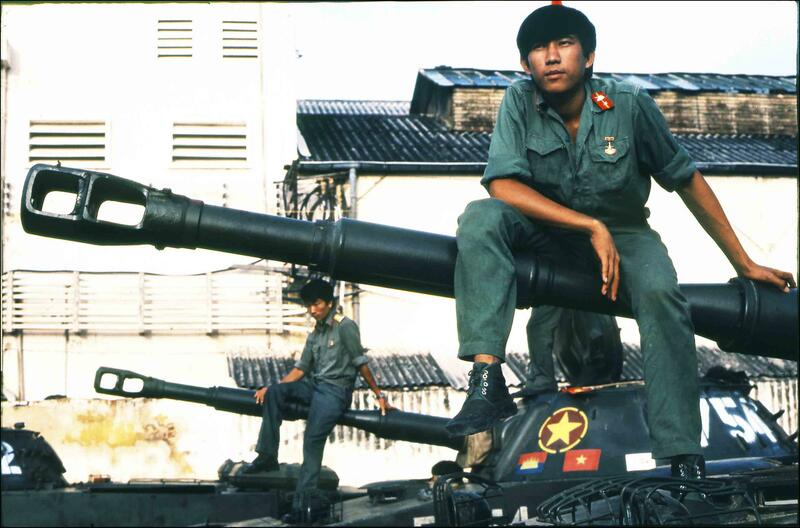 The invasion of Cambodia in 1978 was the most obvious and recent manifestation of that imperialist policy. Phnong people want Chheang Vun to go and make an apology to them in Mondulkiri province for insulting them in the parliament. ពិធី​សែន​ភូមិ​របស់​ជនជាតិ​ភាគ​តិច​ព្នង​នៅ​ខេត្ត​មណ្ឌលគិរី The Phnong people in Ratanakiri province. Vietnamese soldiers accused of shooting at Khmer people working 600 metres deep inside Cambodian territory. ២៩-វិច្ឆិកា-២០១២៖ ពលរដ្ឋ​ភូមិ​ត្រពាំងផ្លុង ស្រុក​ពញាក្រែក ខេត្ត​កំពង់ចាម ប្រមូល​ផ្តុំ​គ្នា​នៅ​ទីតាំង​ចម្ការ​កៅស៊ូ បង្ហាញ​ការ​បាញ់​រះ​ដែល​បង្ក​ឡើង​ដោយ​ទាហាន​ការពារ​ព្រំដែន​វៀតណាម លើ​ទឹកដី​កម្ពុជា។ Khmer workers who claimed they were shot at while working in the rubber plantations in Tropeang Plong village in Ponhea Krek district of Kampong Cham province on 29 November 2012. Six hardy souls from insurance lawyers Wotton + Kearney recently spent time building houses for impoverished families in Cambodia. Chief operating officer Andrew Price fills Lawyers Weekly readers in on their efforts. On 11 November, a team of six from Wotton + Kearney headed to Phnom Penh, Cambodia to build 12 houses for poor Cambodian families. The team consisted of partner Nick Lux, chief operating officer Andrew Price, senior associate Heidi Nash-Smith, lawyers Aisha Lala and Angela Winkler and HR advisor Karen Pritchard. They travelled there with the Tabitha Foundation, a non-profit organisation that seeks to help suffering families in Cambodia. The journey to Cambodia started in January 2012, when a few of us from W+K started talking about the possibility of undertaking this project. The fundraising effort started in May 2012 when five from the firm (three of whom went to Cambodia) took part in the Sydney Morning Herald Half Marathon and raised approximately $9000. A dinner, auction and raffle on 31 May at Manta Restaurant in Sydney, attended by more than 50 people, also raised more than $9000, while a fundraising event at the MARS Gallery in Melbourne raised $3000. We ultimately raised a total of $21,789 for the Tabitha Foundation. These funds bought the materials to build the 12 houses. The first day in Cambodia involved an orientation and included a compulsory visit to Tuol Sleng Genocide Museum and The Killing Fields. Until the arrival of large-scale development around her home in the northeastern province of Ratanakkiri, Sav Samourn, a member of the ethnic Jarai minority, was frightened of wild animals and ghosts. But as trees disappeared and industrial machinery razed the forestland, the old fears fell away. People scare her now. Samourn’s tale of loss and struggle, in the face of a country that is changing at warp speed, is one of three narratives weaving through filmmaker Kalyanee Mam’s new documentary, A River Changes Course, which will have its world premiere in January at the elite US-based Sundance Film Festival in Park City, Utah. “Today, thousands of families across Cambodia have been thrown off their land or evicted from their homes,” Mam said in an e-mail interview. The work is one among 12 in the World Cinema Documentary Competition, in which films from Egypt, Russia, India, Ireland and China, among others, fill the list. A River Changes Course, which was produced by the Documentation Center of Cambodia, is in Khmer and Jarai, with English subtitles. Appetite For Destruction: China’s trade in illegal timber, a report from the independent campaigning organisation Environmental Investigation Agency which was launched yesterday in Beijing, found that while the US, EU and Australia have taken legislative action to stop the illegal timber trade, China lags behind. Chinese trade data from the United Nations Comtrade shows that in 2011 alone 9,973 cubic metres of precious logs were bought by China from Cambodia for a total of almost US$22 million, with a grand total of more than 32,000 cubic metres being imported between 2007 and 2011. Jago Wadley, lead forest campaigner for EIA, said yesterday that the Chinese government was to an extent engaged on the issue and starting to listen, particularly as legislation prohibiting the purchase of illegal timber products passed recently in countries such as the US had created genuine leverage on the issue. “What we’ve identified is that China’s domestic consumption is the elephant in the room,” he said. Though China now needs to certify wood products it sells on to the US, EU and Australia were not illegally logged, its domestic market remained enormous and the country is now the biggest consumer of illegal timber in the world, he said. A woman in Koh Kong yesterday lodged a complaint against her husband, who she said had tortured her repeatedly for several years. Nong Neath, 37, said yesterday her husband, Seng Run, 42, had been violent towards her for five years, but that his cruelty on Wednesday night had been the final straw. “My husband used a pestle to violate my sexual organ two times. I could not endure it, so I escaped when he fell asleep,” she said, adding that the constant maltreatment had her at her wits’ end. Neath said that while her husband was asleep, she dived into the river that flowed beside her home in Khemarak Pumin town’s Stung Veng commune and swam to the local Adhoc office to file a complaint against her husband. “For five years, I endured living with him, even though he beat me almost every day, strangled me and hit me with a knife,” she said. Neang Boratino, the Adhoc co-ordinator in Koh Kong, said he had immediately filed a complaint to police on Neath’s behalf asking for her husband’s arrest. Thai tourists are visiting Cambodia in increasing numbers - with visitors almost doubling in the first half of 2012 compared to the same period last year. Almost 92,000 Thais visited the neighbouring country from January to June, an increase from 48,000, or a 90% jump from the same period last year, according to a Cambodian Tourism Ministry report. An even greater number of Laotians visited Cambodia in the same period, with 107,000 crossing the border, an 87% rise on the first half of 2011. Cambodia is on course to reach its projection of 3.4 million foreign tourists set by the ministry this year. The final quarter is normally high season for the tourism industry in Southeast Asia. The ministry recorded 2.85 million foreigners, almost half of them from other Southeast Asian countries, visiting Cambodia in the first 10 months, 540,000 more than last year or nearly a 24% increase, the Phnom Penh Post reports, citing the ministry's figures. Tourists from other members of the Association of Southeast Asian Nations accounted for 1.2 million visitors in the period, an increase of 36%. It is an incredible paradox of human nature that the same hands capable of creating weapons are also able to craft them into symbols of peace and healing. Jewelry company Saught works with Cambodian artisans to make earrings, necklaces, rings, and bracelets from scrap metal left by landmines. Partnering with Italian NGO Fileo Development Organisation, Saught trains workers in the art of fine jewelery-making as well as providing food and lodging for students and their families. The Singapore-based business offers three lines of socially inspired jewelry with their Freedom from War, Freedom from Poverty, and Freedom from Fear designs. Each purchase contributes money towards subsidizing the workshops, de-mining efforts, and expansion of the startup into other countries that have experienced conflict. After the era of the Khmer Rouge, over 2.7 million tons of landmines were found in Cambodia. Currently, on 13% of the land has been cleared of these dangerous weapons, leaving over 646 sq km hazardous for travel and unsuitable for agriculture. Still one of the least-developed countries on the world, many of Cambodia’s workers earn only about $2 US dollars a day. In an effort to alleviate poverty and aid in the mission to make the country free of unexploded ordinances, Saught has teamed up with NGOs Fileo Development Organisation and Rajana Association. Together, they work to employ 23 students and lecturers from the Temasek Polytechnic’s School of Design. Supporting 27 employees, their 12 designs transform scrap metal from landmines in to gorgeous pieces of jewelry. 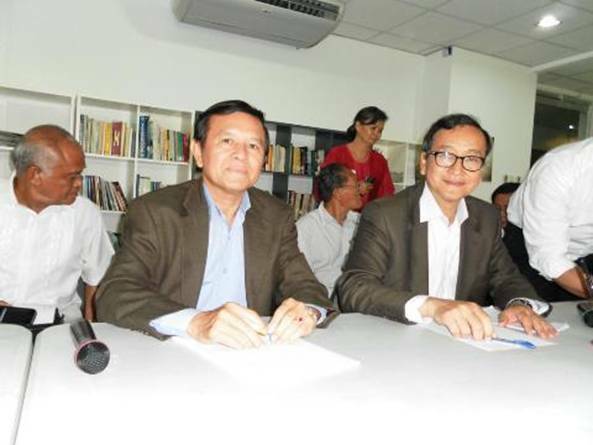 President of National rescue Party Sam rainsy (R) and Vice-President Kem Sokha (L). Cambodia’s leading opposition party said Thursday that it would boycott general elections in 2013 if the government does not reform the electoral process and refuses to allow its president to return to the country where he has been barred from running on the grounds of his criminal conviction. The country’s National Election Committee (NEC), which critics say lacks independence from the ruling Cambodian People’s Party (CPP), removed exiled opposition leader Sam Rainsy as a voter and disallowed him from standing as a candidate in next year’s elections in a ruling earlier this month. The decision was made on the grounds that Sam Rainsy was convicted on charges of incitement and damaging property while leading a 2009 Vietnam border protest, among other crimes—charges he denies and says are politically motivated. Yim Sovann, spokesman for the Sam Rainsy Party (SRP) and one of the founders of Sam Rainsy’s National Rescue Party (NRP), said the NEC ruling was part of a plan to secure a win for the CPP in next year’s elections. The NRP is a united opposition coalition, consisting of the SRP and the Human Rights Party (HRP), aimed at challenging Prime Minister Hun Sen’s ruling CPP in next year’s polls. “The NRP will boycott if Sam Rainsy can't come to Cambodia [to compete in the elections]," Yim Sovann said, referring to the 11-year jail sentence the opposition leader faces if he returns from his self-imposed exile in Paris. Cambodian and Chinese anti-drug experts met on Friday and vowed to further enhance bilateral cooperation to combat all forms of cross-border drug offences. Speaking at the 3rd Cambodia-China Bilateral Meeting on Drug Control Cooperation, Lt. Gen. You Sunlong, secretary general of Cambodia's National Authority for Combating Drugs (NACD), said the meeting was a good opportunity for both sides to discuss ways and measures to heighten the effectiveness of cooperation. "Cambodia is pleased to see good cooperation with China in combating drug" he said. "With close cooperation, we have timely prevented and cracked down on cross-border drug offences." He believed that with the spirit of solidarity, friendship, cooperation and mutual understanding, the two countries' anti-drug cooperation will be further strengthened and expanded in coming years. Chen Xufu, deputy secretary general of China's National Narcotics Control Commission (NNCC), highly valued the good cooperation between the two countries in combating drug. Vietnamese bulldozers and workers destroying 30 hectares of Cambodian forests. សូមមើលវីដេរអូនេះចុះ យួនចូលមកបំផ្លាញព្រៃស្រស់ៗ តែម្តង ហើយអ្នកមកធ្វើការសុទ្ធតែយួន យក​បំផ្លាញស្ងាត់ៗ ពេលប្រជាជន ដឹងនាំគ្នាដកទៅវិញភ្លាមៗ។ តើប្រទេសខ្មែរ ឬជាប្រទេសយួន បានជា​ពួកវាហ៊ានមកធ្វើដល់ថ្នាក់នេះ? ស្តាយព្រៃណាស់។ អស់លោក ស្រឡាញ់ ហ៊ុន សែន ល្មមបើក​ភ្នែក​ឡើង និងមើលឲ្យជាក់និងស្តាប់ ឲ្យច្បាស់ហើយកុំចោទថាគេកុហកនិងបង្កបញ្ហាទៀត! Radio Free Asia - Vietnamese soldiers claimed border land beyond the border posts . សំនួរ៖តើបង្គោលព្រំដែនមានប្រយោជន៍អ្វី បើមេដឹកនាំជាអាយ៉ងគេ នោះ? ក្នុងរូបភាពដែលភ្ជាប់មក នេះគឺជា វាលស្រែដែលយួនយកកាល ពី១៩៩៦ រាប់រយហិកតាតាមព្រំដែន អីឡូវយកចូលថែមទៀតទោះបី ជាមាន បង្គោលបោះជាផ្លូវការហើយក៏ដោយ។ អស់លោកដែលជឿ ហ៊ុន សែន មានដែលជឿប្រជាជន ខ្លួនតាមព្រំ ដែនខ្លះទេ បើសិនជាមិនចេះ មើលផែនទី? In 1975, after five years of civil unrest and increasing cruelty, the Khmer Rouge became the ruling party of Cambodia. Battambang, the city where Sam Ung was born and where his family lived, combusted on April 15. The Khmer Rouge launched missiles into the city center, and Ung, then 20 years old, remembers the smoke, the chaos, the wounded, and the dying with grisly detail. It’s a scene from his life that he revisits in his autobiography, “I Survived the Killing Fields: The True Life Story of a Cambodian Refugee,” which he wrote with his friend, Thomas McElroy. Ung witnessed the death of loved ones, genocide, the loss of his country, and underwent a life of extreme hardship. When he talks about the past, Ung refers to the fact that he had died, many times over, and he came back from death. As a teen, before the Khmer Rouge took power, Ung was combative, sometimes tough and sometimes a hustler. In his novel, he describes his youth with a fondness. He was fascinated by the way Clint Eastwood held a cigarette between his lips in movies, fascinated by the line it made against his face. Ung was enamored with surfing, even though he didn’t really know what it was. He just knew it was cool. But after the Khmer Rouge came to power, he starved and was forced clean human waste out of sewage ditches. Fans of TEEN TOP have donated a bathroom for L.Joe‘s birthday. A few photos under the title ‘TEEN TOP L.Joe Cambodian bathroom‘ were recently uploaded online. The photos show a bathroom with a plaque hanging from it that read ‘Donation by TEEN TOP L.Joe‘. The Cambodian community who received the bathroom had taken a photo with the word ‘Thank you‘ in both Korean and Cambodian. Fans had donated the bathroom for the Cambodian community which did not have a modern one before. Because of the lack of a functional bathroom, the people in the community had suffered from various diseases. Thanks to L.Joe’s fans, the community now has a modern bathroom. The bathroom construction began in September and was finished in the beginning of November. L.Joe’s fans had previously donated to the ‘Korea Childhood Leukemia Foundation‘ last year as well. Culture shock in Cambodia - He said what?! It was a hot Cambodian evening. The air was thick, sticky, sweet and sour all at the same time. Thirty of us were crammed on a bus travelling back to Phnom Penh in time for the massive water festival celebrations. My husband, Andrew, and I began chatting to the guy sitting across the aisle. We talked about our cultures; what people do when they ‘date’ each other, the cost of housing, our studies; everything important to three twenty-something’s trying to make their mark on the world. We were delighted to find so many aspects of kiwi culture were very similar to Khmer culture. Our friend got up to leave when the bus reached his stop, he turned to us and said how nice it was to meet us, and that we must keep in touch via Facebook. Then he looked directly at Andrew and said: “I hope you will have a baby very soon, your wife looks like she will make good children”. Andrew smiled politely and thanked him as he walked off the bus. I looked after him, wide-eyed, eyebrows raised. ‘He said what? !’ I thought. We hadn’t even been married for a year! In every culture there are unwritten, unspoken ‘rules’. Things you say, things you do, and the way you say or do them. Most Kiwis would consider it very rude (or facetious) to make a comment like our Khmer friend did. But that wasn’t his intention at all. In Khmer culture married couples try to have their first child right away. A honeymoon baby is ideal. This proves the marriage is, um, legitimate. Almost everyone we met in Cambodia asked us why we didn’t have children and told us we’d better get started. It was their way of encouraging us in our marriage. In New Zealand people behaved rather differently! As a young wife the most common advice I received was to ‘wait’ and ‘establish yourselves as a couple’. Either that or they didn’t mention children at all. 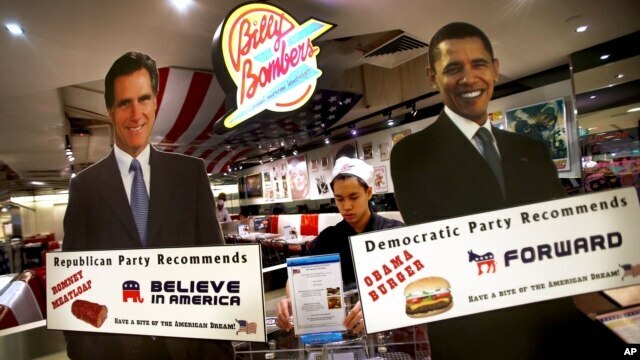 Life-sized standees of U.S. President Barack Obama, right, and Republican presidential candidate and former Massachusetts Gov. 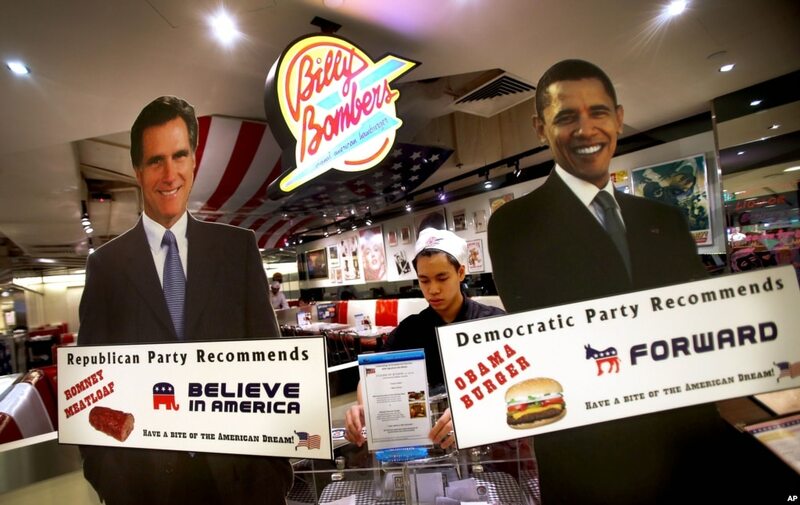 Mitt Romney decorate the entrance of American Diner chain in Singapore, "Billy Bombers" November 6, 2012. The two men will meet for a lunch at the White House, after Romney lost his bid for the presidency earlier this month. PHNOM PENH - Election monitors and other groups say Cambodia’s political leaders could learn something from the meeting US President Barack Obama will have Thursday with his campaign rival, Mitt Romney. The two men will meet for a lunch at the White House, after Romney lost his bid for the presidency earlier this month. In his post-election victory speech, Obama said he would meet with Romney and begin a process of both sides—Democrat and Republican—working together to move the country forward, following a heated campaign between two camps seeking the US presidency. “Cambodia has no political prisoners but politicians with criminal acts”. That is what the Cambodian Prime Minister Hun Sen stated publicly on November 23 during a public speech. Rupert Abbott is the Amnesty international researcher for Cambodia, Laos and Vietnam. On November 18, he published a commentary in the Global Post in which – referring to 71-year-old journalist Mam Sonando – he states “Amnesty International considers him to be a prisoner of conscience, jailed solely for the peaceful exercise of his right to freedom of expression”. Asian Correspondent met him to discuss the state of human rights in Cambodia after the historical visit of US President Obama and the expectations that the ASEAN drew in the country. What do you think of Prime Minister’s Hun Sen statement on human rights according to which ‘Cambodia is not that bad compared to neighbouring countries‘ ? There are certainly other countries with serious human rights problems, including Vietnam for example. But Cambodia’s donors might say that Cambodia has received billions of dollars in assistance from foreign taxpayers. And after 20 years of promised reforms, the justice system looks a bit better, but in substance there has been little change. For example, the control of the courts by political and business elites continues. And we can see these courts persecuting human rights defenders and grassroots groups that have been emerging in the context of land and natural resource conflict and operating outside the usual power structures. This seems to be concerning the Cambodian authorities. But Cambodia should be proud of its civil society, which is changing, and I think that this is not going unnoticed by the government. Look at what happened at Boeung Kak Lake for example, where we saw a community stand up for itself against a forced eviction and actually achieve concessions from the authorities. These communities are learning from each other; the Boeung Kak community is inspiring others, such as Phnom Penh’s Borei Keila’s community. This is different to an NGO going to community and telling them how to organize. NGOs represent human rights – and therefore principles, while these grassroots groups and community groups represent people. U.S. President Barack Obama, left, is shown the way by Cambodia's Prime Minister Hun Sen before the ASEAN-U.S. leaders meeting in Phnom Penh earlier this month. Pic: AP. Do you think Obama’s visit met the expectation of Cambodians? 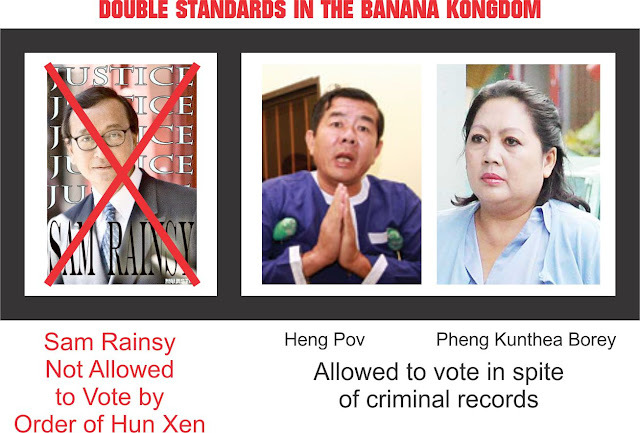 Exiled opposition leader Sam Rainsy accused Cambodia’s election officials on Wednesday of practicing double standards by barring him from the electoral process on the grounds of his criminal conviction while including others with more notorious criminal records. Sam Rainsy’s National Rescue Party (NRP) said the National Election Committee’s decision to remove him as a voter and disallow him from standing as a candidate in next year’s general election was part of a plan to secure the vote for Prime Minister Hun Sen’s ruling party. The decision was made earlier this month on the grounds that the NRP president has been convicted—on charges he denies and says are politically motivated—for incitement and damaging property while leading a 2009 Vietnam border protest, among other crimes. Sam Rainsy said that according to an investigation conducted by his party, others convicted of crimes, including prominent criminals, have not faced the same restrictions. For example, a former police chief serving a 103-year prison sentence following convictions for murder and kidnapping is on the voters’ list, according to the NRP. “My case is unique. The National Election Committee never deletes any criminals’ names, only mine,” Sam Rainsy told RFA’s Khmer service, speaking from Cote D’Ivoire where he is attending an NRP meeting. The National Election Committee removed Sam Rainsy’s name from the lists on Nov. 5, and an appeal against the decision was rejected by the Constitutional Council last week. NRP leaders issued a statement on the party’s investigation saying that Sam Rainsy had been singled out by the election committee on the orders of Hun Sen, whose Cambodian People’s Party has swept elections for years. “Hun Sen is trying, by eliminating Sam Rainsy from the political scene … to unfairly secure another victory at next year’s elections in order to cling on to power for at least another five-year term,” the statement said. 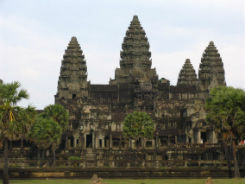 Attractions such as Angkor Wat are drawing Thai tourists to Cambodia in increasing numbers. Photo by Achara Ashayagachat. Tourists from the European Union accounted for 467,452, up 11%. This increase was due to more flights linking Cambodia with Europe but the rate of increase slowed as Cambodia felt the impact of the eurozone debt crisis on the tourism sector, which affected the spending of Europeans, the newspaper quoted Sinan Thourn, chairman of the Pacific Asia Travel Association, as saying. Last year 3.1 million foreign visitors visited Cambodia, about 105,00 of them from Thailand. PHNOM PENH (The Cambodia Herald) - A senior lawmaker from the Cambodian People's Party said Thursday that the ruling party expected to boost its majority in the National Assembly in next year's elections. "Computer results show we'll win more than 90 of the 123 seats," said Cheam Yeap, chairman of the National Assembly Commission on Economy, Finance, Banking and Audit. He said about 3,000 opposition party activists had recently joined the CPP in Prey Veng, where the party lost some ground to opposition parties in commune elections early this year. Cheam Yeap, who was elected from Prey Veng in the last election and is also a member of the CPP politburo, said opposition party members were fed up with their leaders. "I've had four terms in the National Assembly. Citizens voted for Funcinpec in the first election in 1993, but the CPP won control in the next election and that's because citizens saw progress under the CPP leadership," he said. Roland Joffe could never have known how a story of friendship that he helped to tell, born out of one of the greatest tragedies of the last century, would endure and intrigue people to this day. But his 1984 directorial debut, “The Killing Fields,” is still one of the most widely referenced films on Cambodia. It was nominated for seven Oscars and won three, one of which went to the untrained actor Haing Ngor, who played the Cambodian reporter Dith Pran. Now 67, 28 years have passed since the film’s release, and Mr. Joffe is back in Cambodia to participate in the launch of the new book “Phnom Penh Noir” at the Foreign Correspondents Club on Friday. Mr. Joffe now has an arsenal of films under his belt. However, he has stayed connected to Cambodia, not only through the film’s continued popularity as a historical tool, but also through his work as one of the founders of the Cambodia Trust, which helps disabled people. “One can see many of the same problems trying to rear their heads again. Life in the countryside is as tough as it ever was. [Cambodia has] grown up in a very sort of remarkable way in a sense…in such a different world to the world that was [here] before it sickened and died, which I think is a good way to describe what happened with the Khmer Rouge,” he said. A journalist from local newspaper Rasmey Kampuchea is suing Sao Rany, president of the moribund Nationalist Party, for failing to repay $17,532 she lent him. Tith Chan Reaksmey claims that after repeatedly harassing Rany for payment since he borrowed the money in 2010, the party president handed her a cheque for $10,000 in June, which subsequently bounced when cashed in September at Canadia Bank. “Now I have lost patience with Sao Rany. To get my money back, I will file a lawsuit against him to Phnom Penh Municipal Court this week,” she said adding the charge would be breach of trust. Chan Reaksmey said as a result of Rany’s failure to repay the loan her family had incurred debt itself and had been forced to pawn a motorbike, a car and other valuable items. Rany could not be reached, but early this month he said had not borrowed money from Chan Reaksmey but only pledged as guarantor for a loan taken by Bun Tha, an adviser to the Ministry of Information and former editor-in-chief of the opposition-aligned Khmer Amatak newspaper. The wife of Mam Sonando, imprisoned director of Beehive Radio and director of the Association of Democrats, appealed to the government and the court yesterday with a renewed call for leniency for her husband in the wake of US President Barack Obama’s offer of support last week. Din Phannara said that she was delighted to hear that Obama raised the conviction against her husband during a bilateral talk on the sidelines of ASEAN with Prime Minister Hun Sen.
“What Obama picked up [had raised] reveals an authenticity [the truth] that my husband is not involved in the crime for which he was convicted by the court at all, which is why I would like the government and the court to cancel the allegation,” she said. She added that she is still hopeful and confident that the government as well as the court system will find justice for her husband at last. “I hope the Appeal Court will take the case of my husband as soon as it has received the legal documents from the municipal court,” she said. The King of Cambodia officially anointed the late King Father Norodom Sihanouk with the royal title of Preah Borum Rattanak Kod at the Royal Palace yesterday, where his body has lain in state for 46 days. Prince Sisowath Thomico, advisor to the royal cabinet and former secretary of the king, said that the nomination is a court tradition in which the king is offered a new name following his passing. “King Sisowath was also given a new royal name, Preah Sovan Kod,” Thomico said. Historian Ros Chantrabuth, a lecturer at the Royal University of Law and Economics, said the king of Cambodia is customarily offered three royal names – the first comes when he is born, the second marks his ascension to the throne and the third is given after death. During the groundbreaking ceremony for the Stung Meanchey skybridge on November 26, Prime Minister Hun Sen officially announced that the new name would be bestowed at the beginning of the Water Festival. Three projects of the six satellite cities around Phnom Penh that were originally approved by the government have been “significantly” developed, according to officials of the Ministry of Land Management, Urban Planning and Construction. The ministry says the other three are still in the planning stages. The huge projects, costing hundreds of millions dollars, including housing development, economic zones, supermarkets, fitness centres, hotels, industrial parks, hospitals, and other public utilities. Lao Tepseiha, deputy director of the construction department of the Ministry of Land Management, Urban Planning and Construction, said that Koh Pich Island, Grand Phnom Penh International and Camko City have been significantly built among the key projects of the satellite cities. “Development on huge projects is potent and is pushing the building sector in Cambodia up,” he said. Six huge satellite cities were approved by the government, including Koh Pich satellite city in Phnom Penh’s Chamka Morn district’s Tonle Basac commune, Grand Phnom Penh International at Sensok district’s Khmunh commune, CAMKO City in Boeung Pong Peay developmental area at Sensok, Boeung Kak Lake in Daun Penh district’s Srais Chark commune, a future satellite city in Russey Keo district’s Chroy Chongva commune, and Oknha Ly Yong Phat’s satellite city along National Road 6. Four former Ministry of Water Resources and Meteorology department locations in Phnom Penh have been reclassified from state public to state private property, according to the latest Royal Book of November 12. The reclassification sub-decree of the locations, in Teuk Thal and Sen Sok districts, covers a total of 44,456 square metres and paves the way for the property to be leased to private developers. Mao Buntheoun, a department director at the Ministry of Water Resources and Meteorology, declined to respond in detail to questions yesterday, only commenting that he was in the dark about the reclassification. “I know nothing. I don’t know what the purpose of taking this location is for,” he said. Water Resources Minister Lim Keanhour could not be reached yesterday. The sub-decree, signed by Prime Minster Hun Sen on October 30, overrides any existing land arrangements on the subject properties. Six families of former ministry officials who have been living at the locations of the disused departments confirmed they had already been told to dismantle their houses as the plot of land had been sold to a private company. Villagers gather fish from the Tonle Sap to make fish paste, Nov. 28, 2012. Fish production in Cambodia’s great Tonle Sap Lake is on track to reach last year’s level, an official said Wednesday, despite concern from fishermen that yields are dwindling due to environmental problems. Nao Thouk, director of the Fisheries Administration under the Ministry of Agriculture, said that up to 500,000 tons of fish would be harvested this year from the lake, which is a major source of food for the whole country. Fishermen have harvested reasonable catch in the nearly two months since the start of the official fishing season on Oct. 1, Nao Thouk said, adding that the catch will increase until Dec 2012. “We have seen an increase in fish since the start of the fishing season,” he told RFA’s Khmer service. He said the good yield was the result of a government clampdown conducted since May of last year against illegal fishing in the lake. Commercial fishing in the lake is banned. Authorities have cracked down on 5,000 illegal fishing cases since early 2012, arresting 50 people, according to the ministry. Nao Thouk said the campaign was helping fish stocks to increase in the lake, on which over a million Cambodians rely for their livelihoods. But some are concerned that low water levels and other issues are hurting fish stocks in the lake, which is known in Cambodia as the “Great Lake” and produces over half of the country’s fish. Om Savath, executive director of Cambodia’s Fish Action Coalition Team, said the freshwater fish yield will decline compared to last year’s harvest because the water level is low. Electricity Vietnam International (EVNI), a subsidiary of Vietnam’s state-owned electricity giant EVN, is no longer involved in the Lower Sesan 2 dam, a Vietnamese Embassy official confirmed yesterday. Cambodian conglomerate Royal Group and China’s Hydrolancang International Energy Co. Ltd. on Monday signed an agreement in Phnom Penh to build the 400-megawatt hydropower plant in Stung Treng province, which will take five years to complete and will be operated as a private enterprise for 40 years before it is handed over to the government. While government documents show that EVNI has a 10 percent stake in the project and Royal Group holds 90 percent in partnership with China’s Hydrolancang, Vietnamese Embassy counselor Nguyen Chi Dzung said the Vietnamese company had effectively “quit” the project about two months ago. According to Mr. Nguyen, EVNI’s 10 percent stake is still nominally included in the deal because the company had conducted initial preparatory studies and environmental impact assessments, which amounted to about 10 percent of the project’s costs. Those studies were carried out between 2007 and 2009. However, in a statement released after the agreement was signed between Royal Group and Hydrolancang there is no mention of EVNI’s 10 percent share or whether they will make any profits from the project. Though he did not know why EVNI is no longer a part of the project, Mr. Nguyen said that the Vietnamese government is paring back spending. Dana Ruge serves up salsa. Lucy Kempster and Thomas Stocker present to the guests about the trip. Thomas Stocker was one of the students who travelled to Cambodia in December 2011 to help with the Cambodian Rebuilding Program. For his Year 11 Community Studies, he decided that he would like to have a dinner to raise funds for other students to go to Cambodia. The dinner was held on Tuesday November 13. Thomas with the help of the Yr 11 Food and Hospitality work group and Jill Wilkinson served 32 people in the Home Economics Centre at Kingscote Campus a three course Cambodian dinner. The room was beautifully decorated creating a lovely ambience for the evening. The evening included a presentation by Lucy Kempster and Thomas. Lucy was one of the students who also travelled to Cambodia. The slide show was very much appreciated and enjoyed by guests. They commented on the excellent variety of topics covered by the presentation and how it fitted in nicely with the food, atmosphere and music for the night. "Our future is fragile, our hope can break. At any moment, be aware and wide awake. like a Buddha on lotus, mind and meditate. We here now in the Unified States. The land of opportunity, outcome is what you make. So full steam ahead, don't worry about the brakes. A head full of dreams, that idea seems great. We here now, too much is at stake. It's a new kind of jungle, and different kind of struggle." "Over there is where you go after coming back from the clubs," he says, pointing to the nondescript bakery-turned-nightspot Bamboo Island. "You can sing karaoke until, like, 3 a.m."
This is Cambodia Town, the heart of Southern California's Cambodian community, the largest such enclave in the United States, and one of the largest on Earth. And the 33-year-old Ly (he goes by praCh; the spelling is his own) is perhaps its most famous ambassador, a rapper who became an accidental superstar in a country he only knew about through library books and fragmented family tales. Read the rest of the article at OC Weekly.